This week I’ve randomly decided to start obsessing about my piano room again. There’s really no rhyme or reason to what goes on inside my head. I’m having a hard time finishing any one room because I get so bored so quickly. I like to randomly hop from one project to another; most of the time before the first project is even completed. Okay, so first on the ixnay list: get rid of those chairs. Which I did. The maroon one went in my bedroom and the brown one is in my family room. I’ve decided though that I’m just going to purchase two new chairs. As in, brand-new-from-the-store (not Craigslist or goodwill!). I’m doin’ it! Soon, my pretties, very soon. So, um, anyway, I guess just ignore the dining chairs as well ’cause they aren’t stayin’ either. Isn’t my little orchid so cute?! Target. For five bucks on clearance. I swear, I am the queen of Target Clearance. I should do a post dedicated to showing you how to shop the clearance at Target. ‘Cause I’m the clearance master. Almost two years ago my best friend Heather gave me FOUR curtain panels that she didn’t want anymore. And they are nice. Really nice. But they are Toile. And I don’t know how I feel about Toile in my piano room. I mean, it’s really not the style of the room at all. 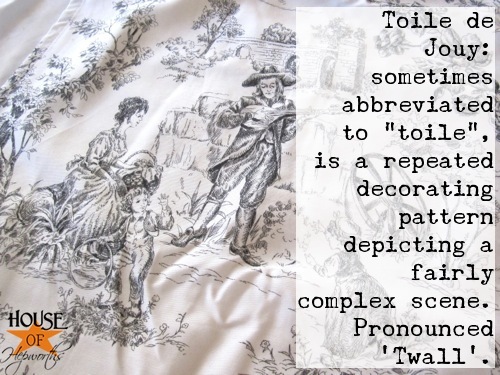 So, what exactly is Toile? What does it mean?!!! 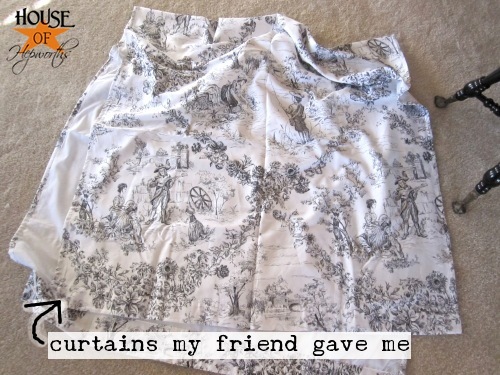 Basically, black and white fabric with fancy European people in fancy clothes and little fancy parasols printed on it. But what the heck. I already have them which makes them FREE, and they are cute, though not really the style I’m going for in the piano room, but I’ll give them a go anyway. To get a full visual I decided to take some thumb tacks and tack them on the wall. Heavens to Betsy, I think I actually like the way they look. Trust me, I am more shocked than you. Oh, er, ugh, ick. No thank you. It’s like Toile threw up in here. Plus, now it looks like I’ve added a curtain panel down the center of one large window instead of having two small windows in here. And that is just plain stupid. Don’t do that. It looks dumb. Okay?! Two and through is what I say. Two and through. Oh wait, I say that about my kids… Um, two is plenty? Two is enough? Let’s just stick with the two panels. These things are in high water central. 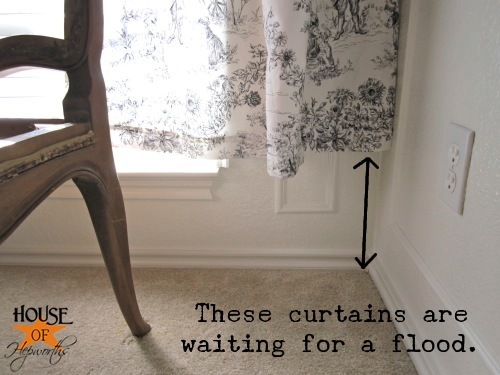 And considering Austin is in one of the worst droughts ever, we do not need to be preparing curtains for a flood. 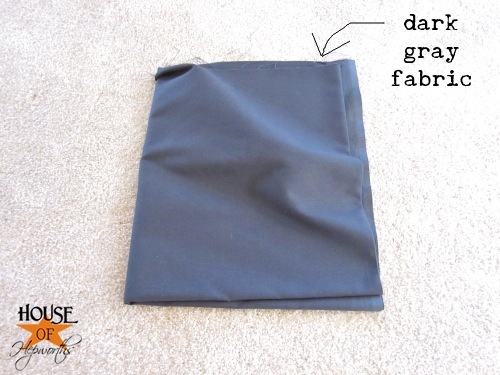 So I bought a yard of dark gray fabric at IKEA to attach to the bottom of the curtains to lengthen them. I’m not really 100% ready to bust out the sewing machine just yet, so I used some safety pins to attach the fabric just so I could see if I was even going to like this idea. The result? I think they are going to look glamfabulous when I’m done with them. The gray actually makes them more luxurious. Now they POP! I may even add a smaller strip to the top. You will just have to wait and see! Isn’t this just the worst way to end a post?! I know. I’m so mean. But seriously, in my defense, I need to now go buy two curtain rods, sew up the curtains, then get them all installed… like a car stereo. Part two will be on it’s way soon. I just wanted to show you my thought process when I decide to decorate the way I do. I test things out. Visualize different looks. And I even use tacks to give me the look I want before I do any permanent damage. 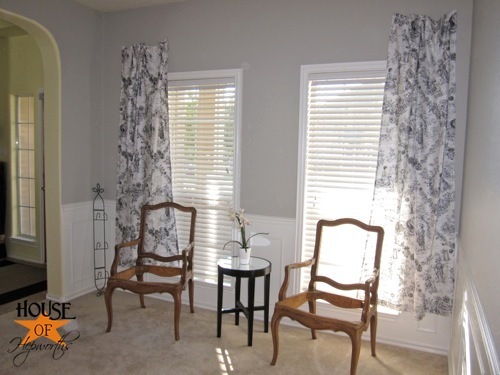 I’m 100% confident in exactly the kind of curtains I want for this room. Now that I’ve visualized it and planned it all out, hopefully I’ll be able execute the plan without any hiccups. That’s the plan at least. Are you a planner and a tester? Or do you just throw caution to the wind and execute projects before thinking them through?! Do you like the toile? I’m thinking the room will be Mid-Century European meets modern classic. Ya, that’s what I’ll call it. Or I can just call it “Allison’s random decorating style with no rhyme or reason (except cheapness).” That works too. So, bottom line: I’m using the Toile curtains. I’m adding some additional dark gray fabric to them. I’ll hang them soon. The End. 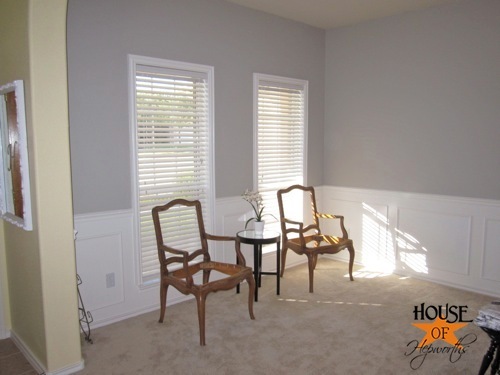 The gray paint color is Route 66 by Dutch Boy. The white trim is Alabaster by Sherwin Williams. The yellow in the hallway is Honey Bear by Dutch Boy. My pictures for my tutorial on how to hang box moulding were accidentally deleted, but here’s the link anyway. Here’s how I added moulding around my windows with rounded edges. The little black table is from Target. Shocker. No, I still have not painted the piano. And I still don’t know what color to paint it. I made the red pillows. Here’s the tutorial. The plate rack leaning in the corner is from Garden Ridge about 9 years ago. I think that should cover it. Feel free to ask me anything else I forgot to include in this list. Allison, I love them! Especially with the grey band on the bottom. Can’t wait to see them finished! I am not usually a Toile fan, but I am loving them in your piano room! Especially with the dark grey added (or soon to be) to the bottom! You MUST do a shop clearance at Target post. That is the one store I always seem to miss when it comes to clearance. Love the curtains! 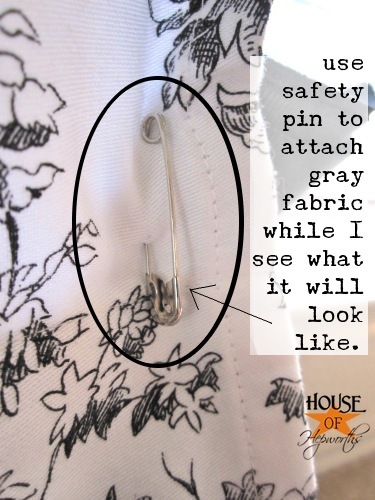 Not a fan of toile either, but it really does work ipthe way you have it! You are Awesome! And I too would love for you to do a post on target clearance shopping! I got in on their toy clearance, and holiday clearance sometimes…it’s so much fun! I need more tips from the pro though. 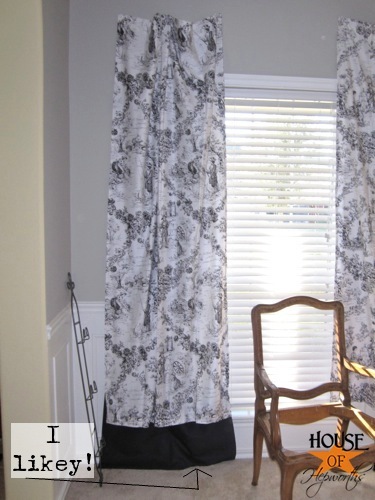 You find some really good stuff..
Make valances out of the toile and then you could lower the curtains still. I wish I could draw it out..
Well…I am loving the drapes!! Gorgeous and perfect! I work pretty much the same way. I use push pins and blue painters tape. Ha!! 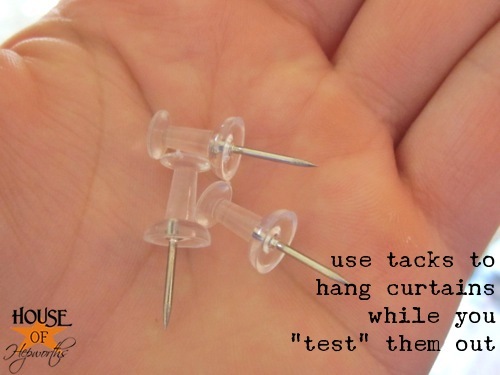 That is such a good idea to use the push pins to test out the curtains! 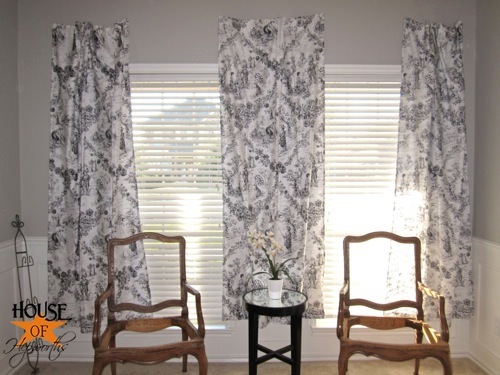 I love toile and the curtains look like they were made for the room. Beautiful! 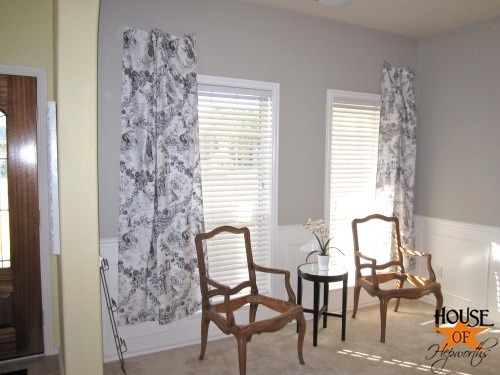 LOVE the curtains! PLEASE, PLEASE, PLEASE do a target clearence tutorial! I have yet to figure out target! I almost spit coffee on my computer screen. Not about your idea but the way you conveyed it to us readers, what a hoot. I do like the toile for your piano room. Isn’t it great when you can upcycle something and $ave money? I also like the chairs too. 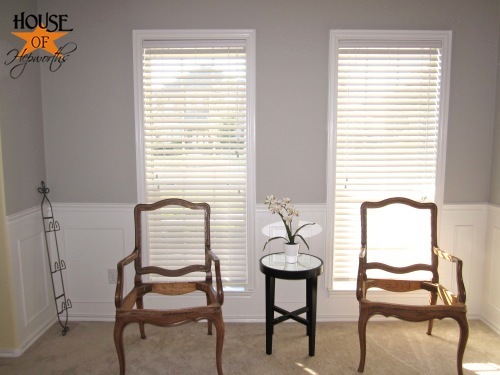 Why not paint them and use the extra curtain panels to cover the seats? You might want to post a warning not to be drinking coffee before your next post. 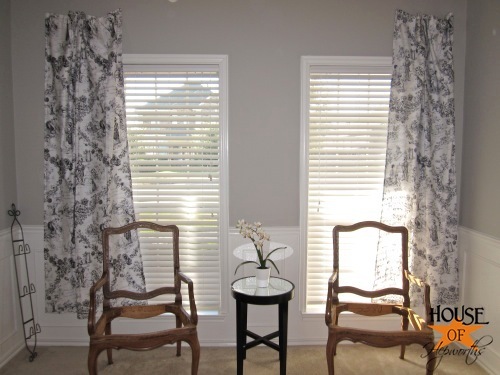 Just to let you know I think the curtain pattern is great! 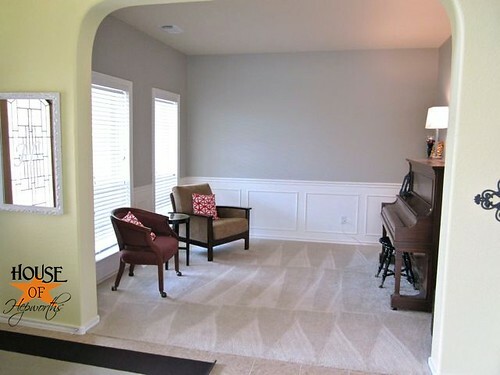 Adds a little “sophistication” to the piano room! Love the added dark material on the bottom. Those will definitely pop now. 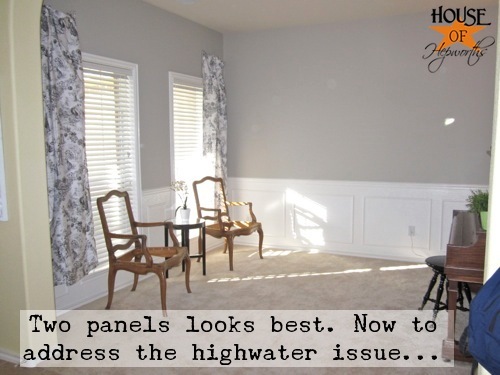 You could use the other panels to make pillows or some other accent decor so it ties in – just a thought. Love the curtains. You were really worrying me at first with the flood curtains. :) I love the grey at the bottom and agree that they give just the right amount of wow! They look great and I think you can totally mix them with other styles…why not?! You’re welcome! I’m glad you found a use for them. You know how I am constantly redecorating a room. It’s a disease! One day Billy will learn to put his foot down…. hopefully not! 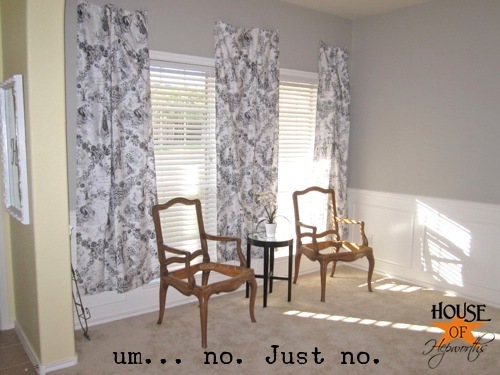 Don’t suggest it, or you may not get any more curtains! So, I love them with the color of the wall! Maybe bring them down just a tad bit more, and I’d make the band at the bottom a bit larger. Take a little more of the toile off, u know, Eugene? And no, I don’t want the other two back. I’d do what someone else suggested and make a pillow or two. Not too many, to avoid the whole toile thrown up bit, but little back bolsters in a new chair would be luv-er-ly! P.S. I miss you too! Come back to Atlanta. I’m sorry I had to ditch. Wish I hadn’t – Denver so wasn’t worth it!!! Why not drape a third panel across the top of both to connect them? Like, hang it from one end to the other and draw up the center to make a swag over each window? I love the added color at the bottom. But I also like it better with the third panel down the middle to make the window look like it spans the room. So it doesn’t look dumb to everyone(wink, wink). Can’t wait to see it finished. I haven’t been much of a toile fan but I like them here especially with that dark blue addition. I am going to have to remember the thumb tack trick because I have many, many, many, many nakee windows and they seem odd sized to me (they probably aren’t–I’m just being a goober) and can’t decide what I want to do to the windows (besides put completely new ones in and change the size and add a few in some spots… uh yeah). I think those are going to be stunning. Especially with what you’re doing with the chairs (AND I LOVE THE WALL COLOR!) so far! You have such a great eye for color and neatness! Well done!